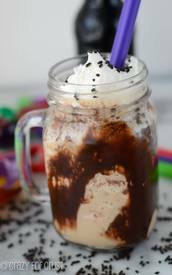 Chocolate root beer float milkshake! I know, no tempering here today, but there is plenty of CHOCOLATE! It's National Root Beer Float Day so I had to make an exception. Whatever it is, I love root beer floats, but I love melted ice cream root beer drinks more. Now, in the heat of the summer (omg, it won’t stop being hot here), I am bringing you a root beer milkshake.